96 well plate(s), where each well contains 1.5 nmol of peptide packaged in 15µg of BSA. Acquired cancer resistance to combination immunotherapy from transcriptional loss of class I HLA. Understanding mechanisms of late/acquired cancer immunotherapy resistance is critical to improve outcomes; cellular immunotherapy trials offer a means to probe complex tumor-immune interfaces through defined T cell/antigen interactions. We treated two patients with metastatic Merkel cell carcinoma with autologous Merkel cell polyomavirus specific CD8+ T cells and immune-checkpoint inhibitors. In both cases, dramatic remissions were associated with dense infiltration of activated CD8+s into the regressing tumors. However, late relapses developed at 22 and 18 months, respectively. Here we report single cell RNA sequencing identified dynamic transcriptional suppression of the specific HLA genes presenting the targeted viral epitope in the resistant tumor as a consequence of intense CD8-mediated immunologic pressure; this is distinguished from genetic HLA-loss by its reversibility with drugs. Transcriptional suppression of Class I loci may underlie resistance to other immunotherapies, including checkpoint inhibitors, and have implications for the design of improved immunotherapy treatments. Paulson KG, Voillet V, Mcafee MS, et al. Acquired cancer resistance to combination immunotherapy from transcriptional loss of class I HLA. Nat Commun. 2018;9(1):3868. Antigen-Presenting Cell-Intrinsic PD-1 Neutralizes PD-L1 in cis to Attenuate PD-1 Signaling in T Cells. The PD-1 pathway, consisting of the co-inhibitory receptor PD-1 on T cells and its ligand (PD-L1) on antigen-presenting cells (APCs), is a major mechanism of tumor immune evasion. PD-1 and PD-L1 blockade antibodies have produced remarkable clinical activities against a subset of cancers. 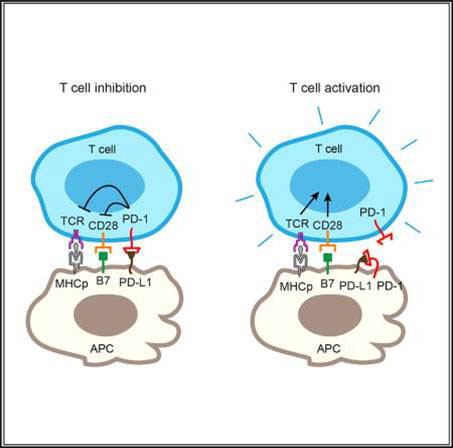 Binding between T cell-intrinsic PD-1 and APC-intrinsic PD-L1 triggers inhibitory signaling to attenuate the T cell response. Here, we report that PD-1 is co-expressed with PD-L1 on tumor cells and tumor-infiltrating APCs. Using reconstitution and cell culture assays, we demonstrate that the co-expressed PD-1 binds to PD-L1 in cis. Such interaction inhibits the ability of PD-L1 to bind T cell-intrinsic PD-1 in trans and, in turn, represses canonical PD-L1/PD-1 inhibitory signaling. Selective blockade of tumor-intrinsic PD-1 frees up tumor-intrinsic PD-L1 to inhibit T cell signaling and cytotoxicity. Our study uncovers another dimension of PD-1 regulation, with important therapeutic implications. Zhao Y, Harrison DL, Song Y, Ji J, Huang J, Hui E. Antigen-Presenting Cell-Intrinsic PD-1 Neutralizes PD-L1 in cis to Attenuate PD-1 Signaling in T Cells. Cell Rep. 2018;24(2):379-390.e6. High-affinity PD-1 molecules deliver improved interaction with PD-L1 and PD-L2. 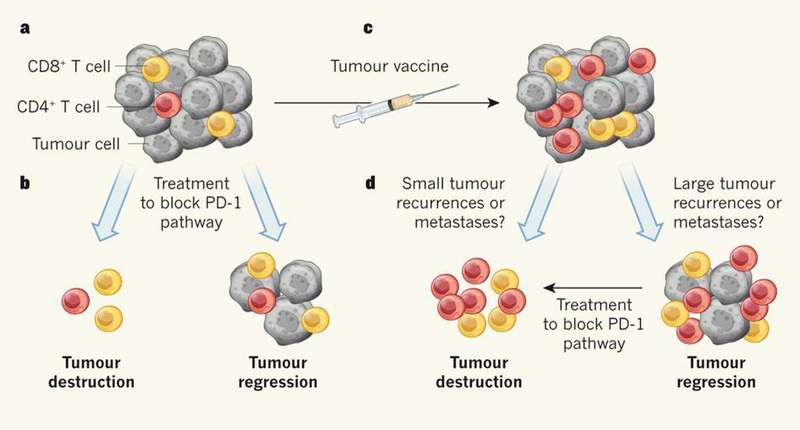 The inhibitory checkpoint molecule programmed death (PD)-1 plays a vital role in maintaining immune homeostasis upon binding to its ligands, PD-L1 and PD-L2. Several recent studies have demonstrated that soluble PD-1 (sPD-1) can block the interaction between membrane PD-1 and PD-L1 to enhance the antitumor capability of T cells. However, the affinity of natural sPD-1 binding to PD-L1 is too low to permit therapeutic applications. Here, a PD-1 variant with approximately 3000-fold and 70-fold affinity increase to bind PD-L1 and PD-L2, respectively, was generated through directed molecular evolution and phage display technology. Structural analysis showed that mutations at amino acid positions 124 and 132 of PD-1 played major roles in enhancing the affinity of PD-1 binding to its ligands. The high-affinity PD-1mutant could compete with the binding of antibodies specific to PD-L1 or PD-L2 on cancer cells or dendritic cells, and it could enhance the proliferation and IFN-γ release of activated lymphocytes. These features potentially qualify the high-affinity PD-1 variant as a unique candidate for the development of a new class of PD-1 immune-checkpoint blockade therapeutics. Li Y, Liang Z, Tian Y, et al. High-affinity PD-1 molecules deliver improved interaction with PD-L1 and PD-L2. Cancer Sci. 2018;109(8):2435-2445. The interaction between PD-1 on T cells and its ligand PD-L1, which is highly expressed on several types of human tumor cells and tumor infiltrating immune cells, restrains the activity of effector T cells against human cancers and chronic virus infections. Figure from: Cell Rep. 2018 Jul 10;24(2):379-390.e6. doi: 10.1016/j.celrep.2018.06.054.